Horror movies are one thing, but here are ten non-horror films that unexpectedly scare the living bejesus out of you. As is a Halloween tradition, many people will settle in with a scary film of some sort. The horror genre is home to plenty of creatively creepy and terrifying imagery that has the power to really stick with you. But you know what’s worse than horror you expect? Films of completely different genres that unexpectedly leave you a shivering mess – never able to trust movies again. Here are just ten of those. And so, we begin with one that really personally affected me. At the time of A Bugs Life, I was expecting Antz to be of a similar - colourfully childish ilk when it first came out… Then came the battle scene. Combining the ferocity of Saving Private Ryan with the otherworldly horrors of Starship Troopers, it terrified my younger self. There was even dismemberment! The shark. Holy crap, the shark. Watching this dark turn of James and the Giant Peach on the wheeled-in primary school TV with VCR was enough to make some of the younger years cry out in terror, while the older ones (me) pretended they were cool, even though that wasn’t the case at all. Watch with caution. Remember those incredible-yet-nightmare-inducing VFX of The Thing - artistically crafted for peak horror? Well, imagine that being adapted to bloody Jumanji. As the girl is grabbed around the ankle by a vine and pulled towards an ominous off-screen monster, little did we know the reveal would be a horrifying monster plant slowly opening up to consume this child. Good grief! This is the first of the “you knew they’d be on this list” variety - that boat tunnel scene. Projected images of horrifying scenes involving creme de la crap your pants of creepy crawlies, while Gene Wilder maniacally screams a poem. Yep, that gave me nightmares for a while. Toy Story is different. When I first watched it in the cinema (and the first 2000 times after that), I was fine with the scene when the toys get their revenge on Sid. The visual scariness of the scene was rather tame. But then, as I grew up, the psychological angle really hit me. For all the terrible things Sid did to his toys, he did not deserve that kind of permanent damage to his psyche. I think about him from time to time, living out his days in a psyche ward. Not much to say about this, they were tiny human/creature hybrids hunted by a giant - causing plenty of jump scares. What seems pretty innocent on the face of it ends up scaring you a lot. Now before I begin, this is not a critique of the film. I bloody loved the cartoon on Nickelodeon and thought Jim Carrey was picture perfect in that part. My only concern comes with the CGI transformation scenes and all round over-the-top reactions animated by the team. They are also the stuff of nightmares. See also: Son of The Mask - horrendous film but equally scary effects. Returning to Oz for a sequel opportunity after the incredible original was a bold move. Also bold was the costume choices for Pumpkin Man and the creepy robot. Anytime they were on screen, I was not watching. Yep. You knew this was going to be on this list. The header image of this article told you that much. 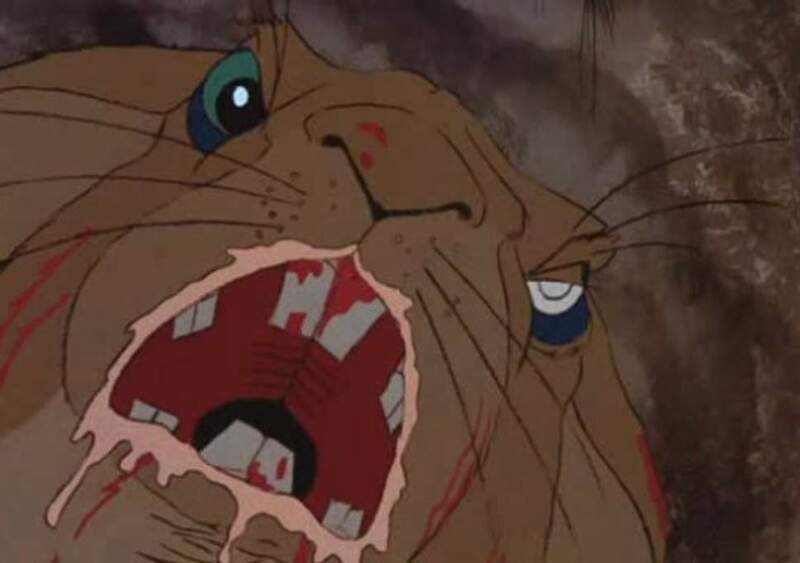 The absolute carnage, paired with the almost-zombification of the rabbits and that terrifying hells cape of rabbit-related death. I don’t need to say anymore than that.